Boat sales, marine services and boat storage for new boats & used boats and cruisers in Ireland. 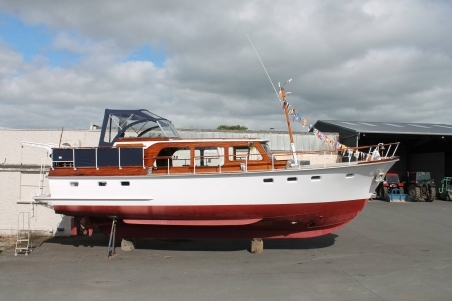 At Portumna Marine's boats for sale, boat storage and marine service facility in Portumna, County Galway, on the banks of the River Shannon, we stock over 30 quality new & used boats for sale and cruisers for sale. All of our used boats for sale and cruisers for sale come fully serviced and are guaranteed for the season and come with new ropes, fenders, safety equipment etc. Portumna Marine pride ourselves on our extensive back up boat services and boat storage to make sure you get the most out of your boat when you have the chance to enjoy it. Along the way Portumna Marine have acquired boat agencies for Broom cruisers, Monterey sport boats, Mastercraft Ski Boats, AGA luxury RIBs, Lodestar inflatables, Fisher Panda generators, Side Power thrusters and various chandlery. We are also approved Volvo Boat Dealers. Portumna Marine were very particular in what marine agency we took as Portumna Marine strive to provide the best quality boats for sale and marine products confident that our customers will be satisfied on delivery and into the future. Portumna Marine's boat sales, marine services and boat storage facilities are open six days per week and are always on the phone 24/7 to deal with any boat sales, boat storage and marine queries you may have.